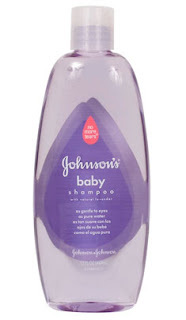 Shame Shame: Johnson & Johnson baby shampoo (and copycat products)! Johnson & Johnson has been a reputable name for so many years. No doubt with the help of it's well known baby care products, who hasn't grown up with their "No more tears" shampoo? In fact this shampoo is used in so many hospital, including the ones I have worked in. Hopefully this post will illustrate that even a big industry leader like J&J can make a stinky error of "non"-disclosure. This is another one of my favorite topics . . . that's right, I'm talking about INGREDIENT LISTING problems!! Call it misleading or call it an omission, call it whatever you'd like! I just wish you'd call J&J and complain (their consumer hotline is (800) 294-3632)! The front label clearly touts "natural lavender", however, you don't find lavender in the ingredient listing whatsoever! [BTW if you click on the picture, you can just make out the "with natural lavender" right under the word shampoo]. The funny thing: it seems like J&J was not necessarily wanting to keep from disclosing its ingredients, but, rather, this story goes to show you that the ingredient list is a lagging afterthought. Another possibility may be that there are indeed other "natural" ingredients that are just labeled as "fragrance" and that's that! Copycat products with copycat osmissions! Pick up that store-brand knock-off of J&J's original lavendar baby shampoo, and guess what? Yup, they make the same ingredient labeling mistake. The front says with "natural lavender" but nary an inclusion in the ingredient listing. I believe the store brand that I was checking out at the time was Target. Come on guys, get it together. Let's hope the next run of these products will include a full disclosure of ingredients on their labels! This post isn't necessarily mean to bash J&J (although I'm sure they could take it!) but to point out that ingredient errors/omissions are made by all types of companies, including those with billions of dollars and untouchable reputations! Till next time readers!! Be well, and remember, the only good tears are those of gratitude! Unfortunately, if the lavender and chamomile mentioned are only included in the fragrance, as I suspect (does it smell of lavender? ), then there is no legal requirement to disclose it. However, I agree that the claim therefore loses some power, and J&J would do well making this clear in the pack copy. Thank you for the past, what you say is absolute truth. Not only J&J many other well known companies play the same innocent omission trick. Who would want to use that horrible product (or any J&J products) anyway! Every year they perform horrible tests on innocent and selfless animals. Help yourself, your children, the animals and the planet, by buying products not tested on animals. This should be reported to J and J...why should there be no mention of the ingredient as important as lavender which could be an allergic one to some?